Before we bring you your Featured Friday Cardmaker....we wanted everyone to know that Hero Arts is hosting a fun party on their Flickr group for the next three days - Sept 10, 11, and 12! 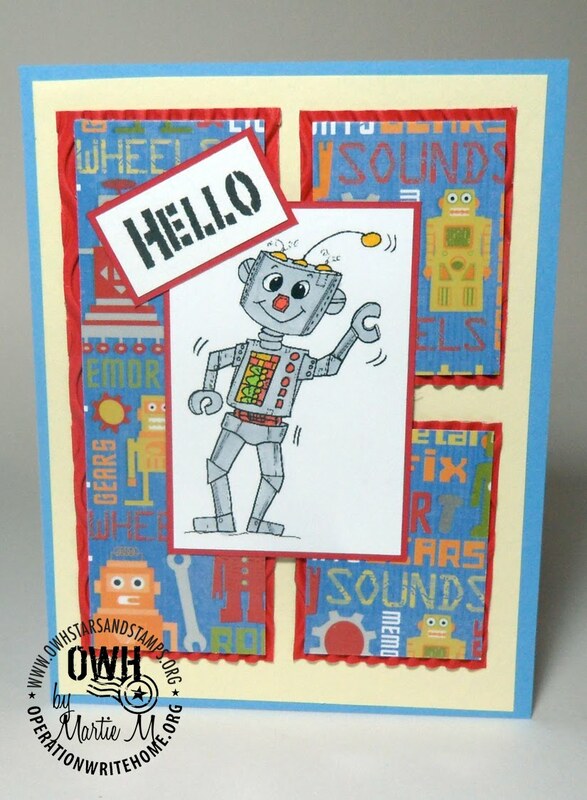 A virtual cardmaking party for OWH...and you know if it's Hero Arts, there's going to be fun and games!! Go play! You can sign up for a free account on Flickr....and that's a great place to share cards here on the S&S blog when we host challenges, especially if you don't have a blog! And now....meet Martie, our featured stamper this week! I started scrapbooking in 2000 when our daughter presented us with triplets. Scrapbooking friends kept urging me to try stamping which naturally lead to card making. I soon found myself spending more time making cards than scrapbooking. I like the short turn around time to a card vs. a scrapbook page. But how many cards can one person use. Then I read a post on 2Peas about Cards for Heroes and all my cards suddenly made sense. I was hooked. My favorite stamp product now is digi stamps. My rubber stamps rarely get used anymore. Digital stamps are just so easy to use and I love the fact that I can size them to fit the space I have on my card. I don’t think I could say I have a favorite technique. Just depends what ’strikes’ me that day. Might decide to sew on my cards. Might even pull out a rubber stamp or two and do some embossing. What I do really love to do is use up my scraps. I make what I call my quilt cards by adhering all the different scraps into a pseudo quilt design. Mixing and matching colors is the most fun of this procedure. The colors I use on my cards are mostly bright colors ( but I HATE florescent colors). Muted colors generally turn me off. This past summer I couldn’t keep enough bright pink, aqua and lime green cardstock on hand. Seemed to be always running to Michael’s or Joann’s for more - and believe me, I shouldn’t be buying more paper. Motivation - I don’t have any family member in the military. In fact, I don’t even know anyone in the military. But how can anyone watch any news, or videos about all these brave young people and not want to do something, anything to help them. As a 71 yr old grandma - this is the one thing I can do. I like to call it my 21st century version of rolling bandages. My prayers are that someday Operation Write Home will be disbanded -------- because all of our brave soldiers will be home. Martie's cards are so cute, we know you're going to want to use one of hers as a jumping-off point. Pick one to CASE - colors, design, whatever inspires you! Leave a link here so we can see what you've created! Martie, your cards are all so cute, each one will put a smile on someone's face! And since we've been challenged to CASE one, I think I'm going to go for the robot! These are all fantastic. I LOVE the colors. That little girl is soooooo cute. I envy your stamping room. My goodness, I would love to come stamp at your house! Martie, your cards are delightful. 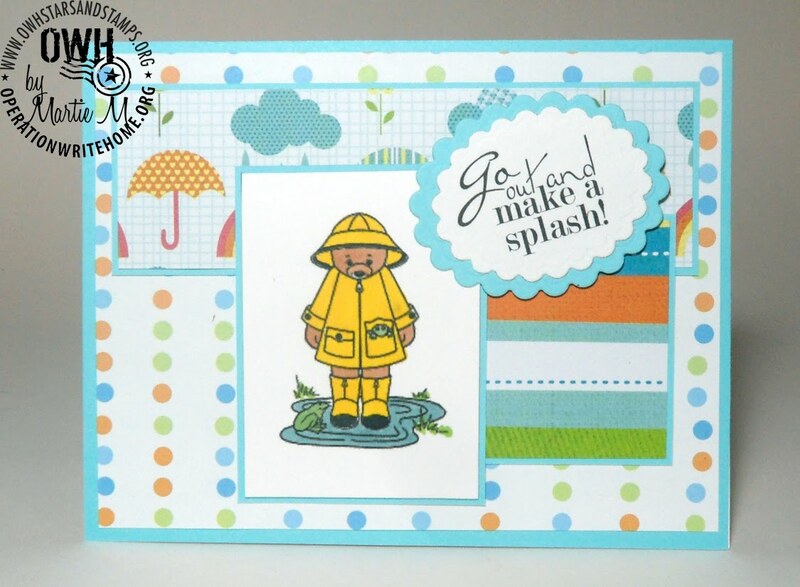 I especially love the "Go out and make a splash!" card! I'd love to know where you find some of those cute digis. Thanks for sharing all these wonderful cards. 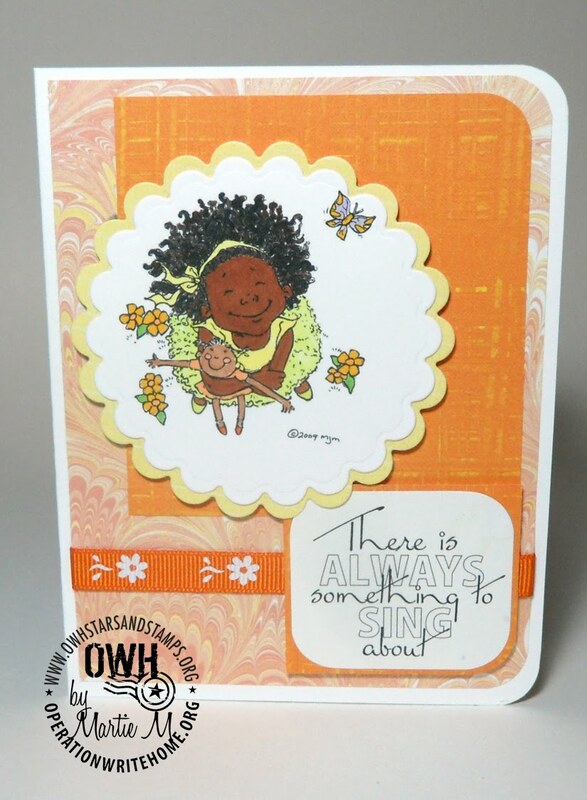 How nice to meet another OWH cardmaker and see your beautiful work! Lucky you to have a hubby who builds you all your craft needs and storage! Great cards, keep up the wonderful work! Martie, I love your cards.. they are adorable and your craft room sounds divine! Wonderful cards Martie. Especially that adorable robot! 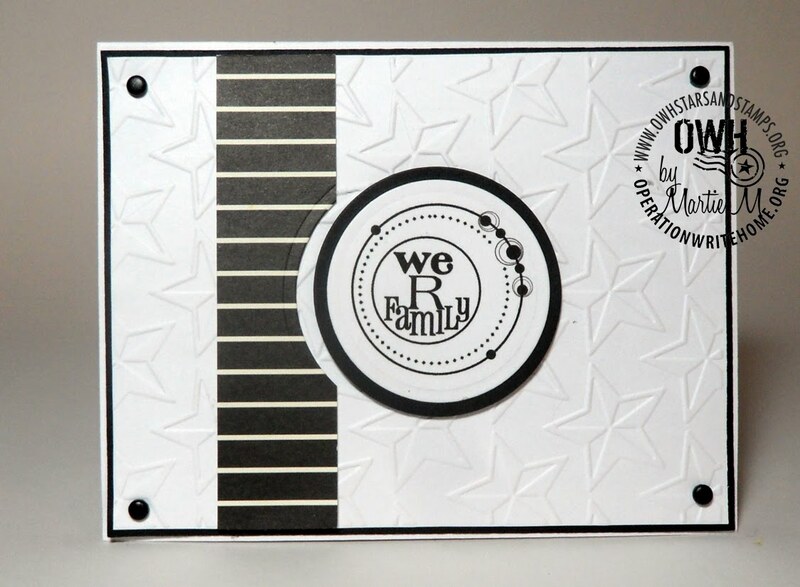 Reading about other card makers is so nice and it really makes OWH feel like a big family. Thanks for sharing you story and your creativity with us. Great cards, Martie! Thanks for being the featured card maker! I made a black and white card too. Thanks for the inspiration! Nice to meet you, Martie. Thanks for sharing your story and all the wonderful cards. Think I'll try to case the cute teen card for this challenge. Thanks Martie for the great cards and inspiration! It was so hard to decide which card to case because they are all so danged cute! Thanks for sharing . . . and it is great to meet you! Martie, love your cards and your comment about making cards for OWH being your "21st century version of rolling bandages."